As we have indicated they are nothing to worry about in as much as they are not likely to become anything more serious but they can be an irritant and often need to be surgically removed. Many Fibromyalgia sufferers - for reasons as yet unknown to doctors - seem to find themselves with skin tags. Many doctors have hypothesised that the problem may be due to heavy sweats which are very common in Fibromyalgia sufferers. These skin tags normally appear as small flaps of skin which hang by a thin thread of skin from the body and can catch on clothing or underwear causing them to become red and inflamed for a time. Many Fibromyalgia sufferers find that they experience night terrors or severe nightmares which cause them to sweat and which through time causes these skin tags to appear on the body. What Should I Do if I Find a Skin Tag? The first thing to point out is what you should not do; and this is not to try and remove the skin tag yourself. It is important to remember that these tags are growths of skin away from the flesh covering the body so if you should try to cut them free or pick at them then they will hurt and they will also bleed quite profusely. If you do find that you have skin tags on your body then it is advisable to visit your doctor who can remove them for you. It is again important to stress that under no circumstances should you try to remove them yourself. The procedure that your doctor will carry out is a quick and painless one. He or she will use either perform the procedure or ask a nurse to do it. Either way there is nothing to fear from this procedure and it is best to have it done sooner rather than later, thus avoiding further growth of the skin tags. 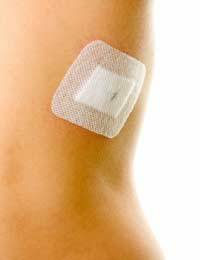 The process involves using a local anaesthetic to numb the area around the skin tag and then using a sterilised scalpel to cut the tags away. Once this is done the area is bathed in a solution to prevent infection and covered with a small dressing and plaster. In essence the procedure should take no more than a few moments and should be done at your local surgery. It is worth noting also that these skin tags are not simply confined to individuals with Fibromyalgia; they are found on healthy individuals especially those who have higher than normal levels of certain hormones in their body such as pregnant women. They are also to be found on individuals approaching middle age or entering their sixties. However because of the nature of the problem i.e. : the fact that is caused also by sweat - it can be common among Fibromyalgia sufferers because they experience heavy sweats at irregular intervals and sometimes with no reason at all. This is one of the common symptoms of Fibromyalgia. If, regardless of your health, you discover that you have skin tags then your doctor will be happy to remove them for you and again it is important to point out that they are not dangerous and are not an indication of any form of cancer. If you do have skin tags then the most important piece of advice that can be given is not to panic as there is nothing to fear from them and their most common reason for removal is irritation.